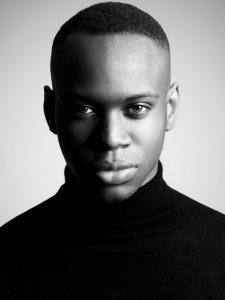 Richard Braqo, hailing from Ghana, was the first ever recipient of the Cesare Paciotti Accessories Award for shoe design at Parsons School of Design in 2009 after which he went on to collaborate with Paciotti on a collection that sold in New York to Saks and Barney’s launching at Vogues Fashion Night Out. Since then, Braqo has gone on to work with the likes of Ikram Goldman, Glamour Magazine’s Suze Yalof Schwartz and Acne studios with previous stints at Helmut Lang and Zegna. Braqo’s shoe designs have also been featured by Mark Holgate for Vogue US, Surface Magazines, Essence amongst others and styled on the likes of Ciara and Rihanna by Mariel Haenn. This is the debut collection by Richard Braqo and reflects the designer’s personal quest for identity, The collection is bravely juxtaposing masculine details with the feminine silhouette. It’s a fusion between the classic and timeless with a touch of the unfamiliar. The “ankle bangle” and the “pearled spear” are unique details that transforms the silhouette. The designer’s own birth stone the pearl features throughout the collection in the signature speared pearl motif.Made in Italy from the finest materials the Richard Braqo collection is crafted by the same artisans that deliver impeccable and unparallel quality to leading international fashion houses.